Image courtesy flickr user Tom Gill (lapstrake) - used under a creative commons licence. This site has been our community's little corner of the interweb, our little piece of digital cyberspace. All the content has been provided by our community, by you. Without you, there would be no site, no stories, no pictures. For all your contributions, I'm so very grateful but all good relationships invariably come to an end. Regrettably, after maintaining this site for over 11 years, I am no longer in a position to continue to do so. The site will remain visible for a while after today but will no longer accept new content. 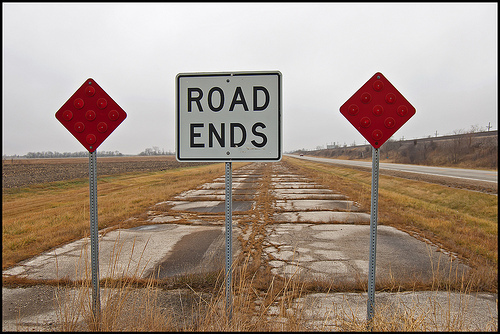 Without new content it will gradually lose its relevance and decay. A backup of the site content will be taken so that the content is not lost. I would like to pass my thanks to every single one of you that has contributed, over the years, to make this site such a valuable resource for our community. One has to be careful when naming names lest someone gets offended by an omission, but I'd like to pass on my sincerest thanks to Pete, Geoff, Sally, Dot, Ricky, Pete Byers, Reg Rush, Len Woodhead, Mary Haslam, Stuart Rogerson, Margaret Amos and the many, many others who've contributed over the years, who've chosen to share their stories, their pictures, their memories, who've made it all worthwhile. Why Don't You Enter Your Terrier? 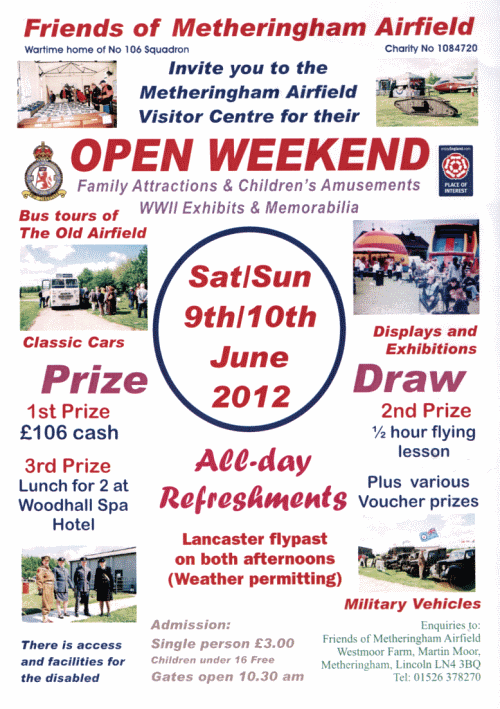 Continue reading Metheringham Airfield Open Weekend - 9/10 June 2012. 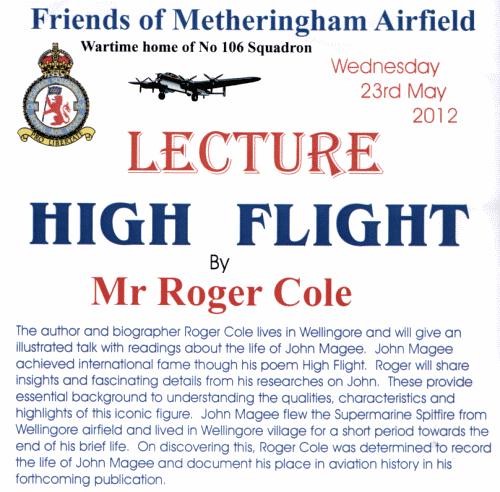 At the Metheringham Airfield Visitor Centre - in the old gymnasium - on Wednesday 23th May 2012 at 7.30pm. Admission: Members free, Visitors £5.00 including tea/coffee and biscuits. Access and facilities for the Disabled. All proceeds in aid of the Visitor Centre / 106 Sqn Museum. Get Out Your Bunting And Get Ready To CELEBRATE! SUNDAY 3RD JUNE- our celebrations start with jubilee big community lunch on the playing fields. Bring your own tables, chairs and food, listen to a folk band, have a go on the bouncy castle or have your face painted, join in the fun of the vintage fun fair from 12 noon onwards. Could we please ask for any vehicles to be moved on the high street from the garage to princes street and onto the playing fields via the cross from 13:30 - 15:00 on this day only. We have already got permission from the police to close grange road from 13:00 - 14:00. This will make it easier for all our floats to parade. 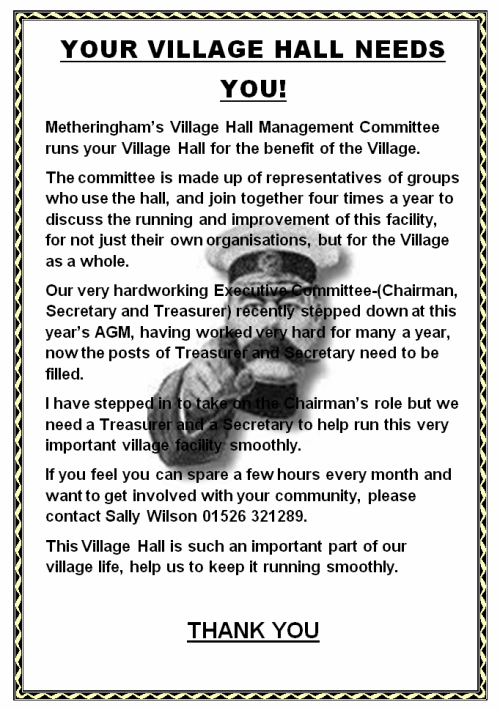 Metheringham Village Hall Committee - Help2! 1. Welcome and Introduction: Councillor Dr Michael Allen - Chairman to Metheringham Parish Council. 2. Notes of the last Annual Village Meeting held on 19th April 2011 to be approved and signed as the minutes. 3. Annual Parish Council Report: Report from Cllr Dr Michael Allen covering the activities of the Parish Council. 6. Break for refreshments, a chance to view exhibits and socialize with the guest speakers, representatives from the village organizations and your Parish Councillors. 7. Reports from village organizations. 8. Date, time and venue of next meeting: To be announced. 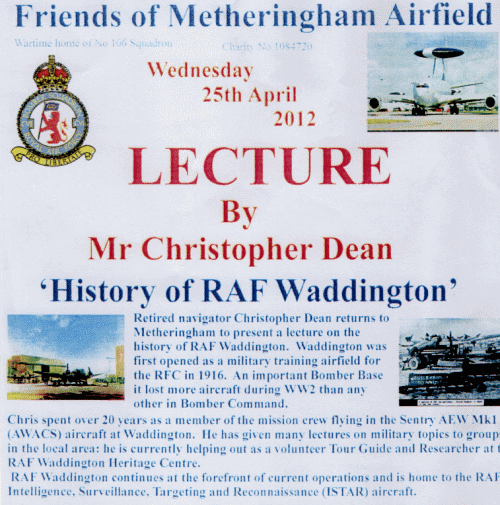 At the Metheringham Airfield Visitor Centre - in the old gymnasium - on Wednesday 25th April 2012 at 7.30pm. Admission: Members free, Visitors £5.00 including tea/coffee and biscuits. Meg PC is the previous category. Nocton PC is the next category.